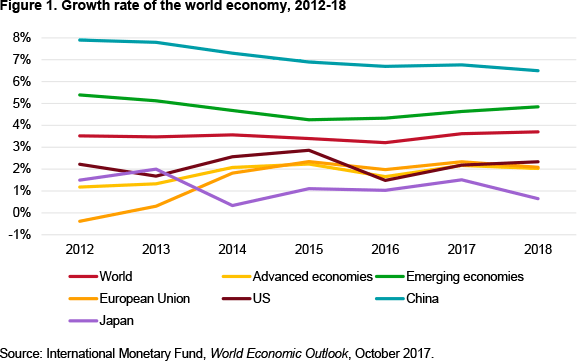 The world economy seems to be rebounding definitively from the Great Recession, but many and varied risks still threaten consolidation of the recovery in 2018. After many disappointing years, 2017 saw a significant change in tendency at the global level that suggests that the global economy is finally overcoming the lingering aspects of the Great Recession and entering a new phase of greater dynamism (see Figure 1). At the same time, this change in tendency also allows us to rule out the possibility of ‘secular stagnation’. The US has reached full employment, political uncertainties have barely affected the EU economy, Japan has begun to harvest the first fruits of Abenomics, China is effectively managing the transformation of its productive model, India continues to grow at a rapid rate, South-East Asia boasts a strong dynamism and both Russia and Brazil have managed to pull out of their intense recessions of recent years. This positive scenario is reflected in the rise in the price of commodities, particularly petroleum, the price of which has stabilised above US$60/barrel (after the agreement between OPEC and Russia to limit production), as well as in the 3.6% rise in the volume of world trade. In this context, only the low level of inflation –which continues to resist rising above the targets set by the principal central banks in spite of the extraordinarily lax monetary conditions of the last decade (reflecting a lack of aggregate demand and the efficiency drags generated by the rise in inequality)– keeps us from seeing clearly that we have entered a new virtuous cycle of growth. 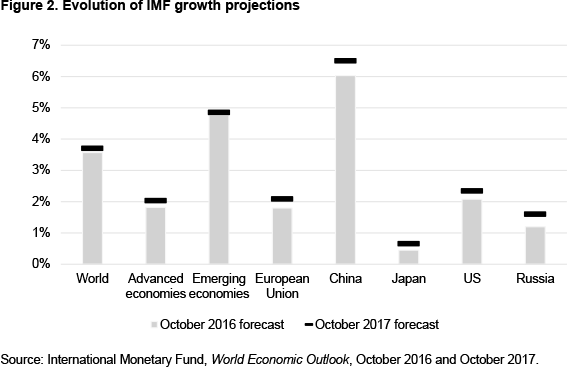 The most recent projections released by the IMF for 2018 –in which the international organisation revised upwards its projections from a year earlier (see Figure 2)– support the continuity of this scenario, to the extent that it suggests a faster acceleration on the part of emerging economies and a certain amount of stabilisation in the growth rate of the developed countries. In fact, although the level of world debt continues to rise (in the third quarter of 2017 it reached a new record level of €193 trillion, or 318% of world GDP), credit has begun to grow again strongly, and some countries could be sowing the seeds of new property bubbles. Nevertheless, as with all years, 2018 will present diverse economic and geopolitical risks that could threaten these projections. Almost all these risks were also present in 2017 but, far from disappearing, they have further evolved to incorporate new factors that must be taken into account. Furthermore, almost all of them have a low likelihood of materialising and the only one that would be systemic –a military conflict between the US and North Korea– should be avoidable. For all of this, and despite the enormous geopolitical changes that continue to affect the world economy, 2018 should be a relatively calm year, although the possible appearance of black swans should never be ruled out. During his first year as US President, Donald Trump managed to get through his promised tax reform, the most profound since the Reagan Administration. The legislation provides for a general tax cut affecting all income tax brackets but especially corporate taxes. Beyond the short-term stimulus that the tax cut might give rise to, it is likely that the estimated increase in public debt and inflation that it will generate will push the Federal Reserve to raise interest rates faster, with a risk for the stability of the international financial markets due to the possible abrupt appreciation of the dollar and the instability that could appear in the fixed income markets. For this reason, and even though the new Chairman of the Fed, Jerome Powell, appears inclined to continue the policy of his predecessor, Janet Yellen, his first months in the post will keep the financial markets on alert. In international politics, everything now seems to indicate that the Trump Administration has discarded two key election promises that implied a significant risk to world economic stability. It does not appear now that Trump will pull the US out of the World Trade Organisation (WTO), or that he will start a trade war with China (nor has he withdrawn from NAFTA, which instead is being renegotiated). In the end, therefore –whether it is due to the powerful US system of institutional checks and balances, to the influence of multinational corporations (should they have finally managed to have their voices heard in the White House), to the substitution of more radical advisors with more moderate voices, to the dynamics of the upcoming mid-term legislative elections in November or simply to the incapacity of the Administration– it appears increasingly less likely that Trump will take the US out of the liberal and open international order which has sustained global growth and development for decades. On the other hand, it does appear clear that the US will assume an increasingly isolationist position, that it will not be an amenable and cooperative partner with the other countries of the West and that it will continue to pursue gradual measures which undermine global economic governance. Among such measures already introduced have been Trump’s withdrawal from the Paris Agreement on Climate Change and the Transpacific Partnership, his refusal to fill vacant posts at the WTO’s conflict resolution body (which could paralyse the organisation), the cut in US funding contributions to the UN and its withdrawal from UNESCO. This latter decision –justified by the organisation’s supposed anti-Israel bias– together with others like the refusal to certify the nuclear agreement with Iran and the moving of the US embassy to Jerusalem, reflect a higher degree of unconditionality in US support for Israel that could undermine altogether its already degraded role as mediator in the Middle East. With respect to the Middle East, given that the military defeat of Daesh in Syria and Iraq appears imminent, geopolitical uncertainty will emanate from the increasingly less submerged dispute between Saudi Arabia and Iran over regional hegemony in the Middle East, as well as from the regional implications of such a conflict in countries like Syria, Yemen, Qatar and Lebanon. At the same time, Saudi Arabia is attempting to launch profound domestic reforms that will very possibly face strong opposition from the most intransigent interest groups at home, and the Islamic Republic of Iran is experiencing growing social protests against the regime. At the other extreme of the Asian continent, the principal focal point of instability is in North Korea. After a year in which the ongoing (and successful) nuclear and ballistic missile tests undertaken by the Pyongyang regime have raised tensions in the area to unprecedented levels, the Japanese Prime Minister, Shinzo Abe, has proposed a reform of the pacifist Japanese constitution in force since the end of Second World War to allow for the existence of Japanese conventional armed forces. In this respect, the major fear for 2018 –a year in which the South Korean city of Pyeongchang hosts the Winter Olympic Games– is that, within the framework of the current dynamics of action and reaction between North Korea and the US, a miscalculation might unleash armed conflict, something that surely would have devastating consequences for the world economy. On the other hand, the possibility that China might provoke a systemic crisis appears to be lower than in past years: the transformation towards an economic model which prioritises domestic consumption, services, innovation and development moves forward without significant disruptions, and political stability has been reinforced with the consolidation of power under Xi Jinping at the 19th National Congress of the Communist Party of China. Nevertheless, it should not be forgotten that that same Congress confirmed China’s intention of pursuing a more assertive foreign policy and –appropriating the power vacuum which the US is beginning to leave behind– to expand its influence on global governance, offering itself as a successful, alternative model of development in which it is not essential to renounce political authoritarianism. But it should also be noted that China has not yet resolved certain structural problems like rising debt and overcapacity, and the longer it takes to resolve them the more difficult they will be to manage. In the EU, the rise of populisms and the evolution of Brexit will continue to be the two potentially most dangerous factors for stability. After a 2017 in which the extremist parties did not manage to triumph in a range of elections (although they strengthened their positions), in 2018 Italy will hold elections in which it is projected that the Five Star Movement (M5S) will do well. If this party were to obtain power in the Euro zone’s third largest economy –the banking system of which is in a delicate situation– one could expect episodes of high volatility in the international markets and a greater delay in necessary reforms for the single currency, which are already difficult to undertake. In the same way, we will need to be on the alert for further authoritarian drift in Hungary and Poland, to the influence that the extreme right in Austria could influence after its recent entry into government and to the possibility that Alternative for Germany could become the principal opposition party –significantly increasing its parliamentary weight and media spotlight– if Merkel’s CDU ends up with another Gran Coalition with the social democrats. With respect to the withdrawal of the UK from the EU, the terms of the Brexit agreement should be known by next autumn. Should a ‘hard’ Brexit result, the profoundly negative effects on the British (and by extension, although to a less degree for the European) economy, will quickly follow, even though formal exit is expected only in 2019, or that the transition period will extend at least to 2020. Other events that might also disturb EU stability would be a deepening entrenchment of the political situation in Catalonia, or an intensification of Russia hostility –once it has overcome its grave economic crisis thanks to the rise in the price of hydrocarbons–. It seems certain that the image of Vladmir Putin will be further strengthened (if that is even possible) with respect to the upcoming elections in March. In any case, 2018 should be a good economic year for the Euro zone; it could benefit from a depreciation of the euro against the dollar and from an increase in consumption (and the employment it would generate), along with an expected rise in wages, if the announced reduction in BCE market operations (the purchasing of government debt) does not increase the volatility of the markets. It will also be a year that determines whether the EU is capable of forging new free-trade agreements that strengthen its leadership position in international trade as the US withdraws. In Latin America the coming year will be shaped economically by the rise in the price of raw materials and, politically, by the intense electoral cycle embracing a number of the region’s most important countries, unfolding now in a climate of tension and increasing intolerance of corruption among the electorates. The citizens of the two Latin American giants, Brazil and Mexico, will hold elections and the results should determine the direction in which the continent moves. In Brazil, it will be essential that the chosen candidate can bring an end to the serious institutional and social crisis generated in the wake of the impeachment of Dilma Roussef. At the same time, the new Mexican President will be responsible for renegotiating the NAFTA treaty with the US (it is unlikely that a new agreement will be reached during the first months of 2018, as hoped) and, in general, for dealing with the hostile policy feints that could come from the Trump Administration. Important elections will also take place in Colombia that will affect the consolidation of the FARC peace process. In Venezuela a new Maduro victory seems assured, even if in this case not so much because of the voting, as of the numerous obstacles facing the opposition. However, the elections could spark a new wave of mass social protests, fed by the economic and social debacle of the country –which might be alleviated if the price of oil continues to rise–. In any case, the collapse in Venezuelan oil production has forced a reduction in its aid to Cuba which, together with the cooling of relations with the US, will have to be dealt with by the successor to Raul Castro as leader of the island. Finally, as in previous year, the epicentre of instability in Africa is the Sahel, the focus of terrorism and organised crime in a context of weak states, extreme desertification and explosive demography. In the end, all of this is provoking large and unorganised migratory flows. In general, however, the African continent will continue to grow and develop its future potential. In this context, the Spanish economy should continue to growth relatively strongly, perhaps even surpassing again 3% annual GDP growth, producing half a million new jobs. Growth is driven by the rise in tourism, low interest rates, export sector dynamism, the positive performance of investment and consumption and looser fiscal policy. This should help unemployment continue to fall towards more socially sustainable levels, along with inequality and poverty, which have increased dramatically in the last decade. In addition, assuming oil prices do not rise too much and that Spain’s principal trading partners continue to demand Spanish products, it should continue to combine strong growth with a current account surplus. This would contribute to reducing the very large net deficit international financial position and the vulnerability of the Spanish economy to external shocks. The only great risk to the consolidation of positive economic growth this year is that, as mentioned before, the instability in Catalonia could get worse. All the above-mentioned factors should be placed within a general global context of various megatrends. One should also underline that beyond the risks facing the world in 2018, there are also long-term challenges that the international community will have to face. As far as global trends are concerned, the tendency towards economic convergence between advanced and emerging countries will continue (although certainly at a slower rate than experienced in recent decades as China’s economy slowly decelerates), advanced-country populations will continue to age, as they will in China, the urbanisation process will accelerate, above all in Africa and Asia, and foreseeably, economic inequality with continue to increase within countries, both in the richest (above all in the Anglo economies) and in the emerging and poorer countries. In addition, the fourth industrial revolution –that is, the interaction of (1) robotisation/automation of production, (2) interconnection via the ‘Internet of things’, (3) advances in artificial intelligence, and (4) the possibilities opened up by the use of ‘big data’ and 3D printing– will continue to develop. This will oblige our societies to conceive of new proposals for the ‘social contract’ to avoid inequality from reaching politically unsustainable levels as citizens face a decline in high- and medium-skilled employment opportunities. Finally, the world will continue to face the problem of climate change, without a doubt the largest long-running challenge to the future continuity of our way of life. 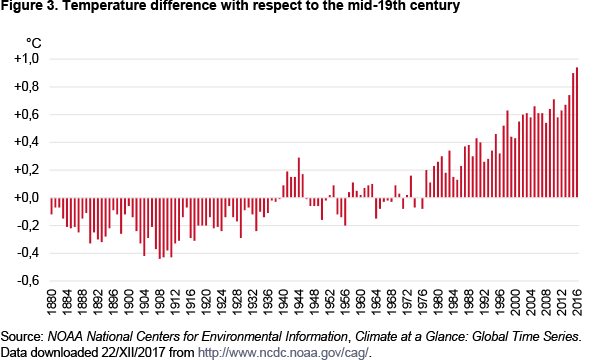 As Figure 3 illustrates, it is impossible to deny that there has been increasingly intense climate change stemming from human activity and that it is slowly increasing the temperatures of the planet. To confront this phenomenon is crucial, but requires international agreements at a moment when, as mentioned above, the world is entering a dangerous dynamic in which such accords are increasingly less likely. The year 2017 was relatively calm and none of the principal geopolitical risks threatening the world economy materialised. Donald Trump did not fulfil his most controversial election promises, the Chinese economy did not experience a hard landing, and populist programmes did not win any further elections in the Euro zone, although the motives underlying the discontent among the citizenry still endure. The situation has allowed for a synchronised acceleration of economic growth across most countries, both emerging and developed, that now appears to augur the approaching end of the long hangover from the Great Recession that began in 2008. This is certainly good news which, if confirmed, would definitively bury the feared ‘secular stagnation’ hypothesis which has preoccupied economists and politicians alike for years. Nevertheless, the risks have not disappeared and nearly all remain latent. There are also new focal points of tension to consider. It does not appear that the US will destroy the liberal and open economic order, but it is abdicating global leadership and will continue to undermine the already weak global governance system, above all with respect to the WTO. Fears of populism in Germany and France have given way to fears of populism in Italy, North Korea will continue to be the principal global geopolitical threat, Saudi Arabia and Iran will experience domestic tensions, and Latin America prepares to elect a new batch of leaders. At the same time, the principal central banks, given the new macroeconomic scenario, will continue their progressive pull-back from monetary stimulus through a reduction of balances and a rise in interest rates, possibly putting the stability of the financial markets at risk (if such a policy is not executed with care). On the other hand, the world economy is to likely face diverse global trends that will, inexorably, shape the world’s future evolution in the decades to come. These trends include the fourth industrial revolution, the transition from multilateralism to multipolar rivalry and the displacement of the world’s geopolitical centre of gravity from the Atlantic to the Pacific.